Sixteen years after he died, famed roboticist Alastair Sterling wakes in a robot body to a world he barely recognizes. Artificial beings walk the Earth, many of them based on his own memories and designs. Confused about his resurrection and this brave new world, Al visits his old research partner Brendan to find more surprises in store, including a brilliant young gynoid who looks suspiciously like Al himself. Blue Delliquanti's O Human Star explores many of the questions of identity and memory that come with the idea of robot copies and the idea of resurrection through technology with an LGBT twist. Alastair Sterling dreamed of grand robot designs, of artificial beings that walked and talked and thought and felt as keenly as biological beings, but he never lived to see his vision become reality. So when he wakes feeling as if mere hours have passed since the moment of his death, he is amazed not only to discover that he is a copy of his former self but also by the march of technology. But the greatest shock comes when he visits Brendan Pinsky, his former research partner. Over the last 16 years, Brendan has become not only the CEO of the world's most successful robotics company, but also the father of his own robot daughter, the irrepressible Sulla. 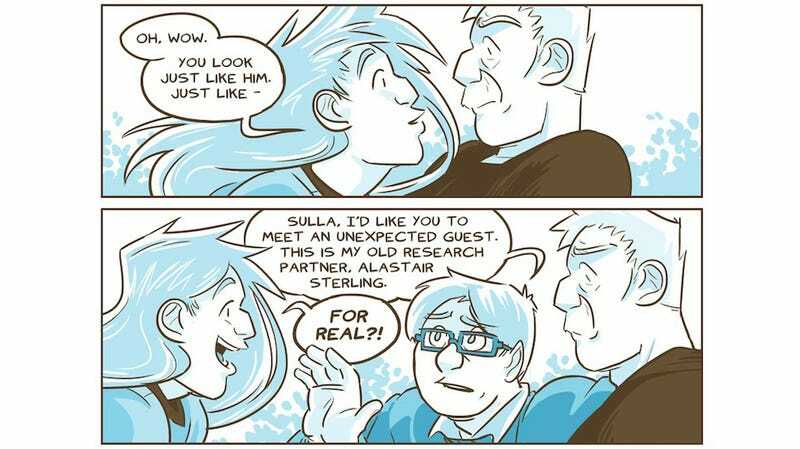 Sulla is incredibly strong, fast, intelligent, and curious; she also happens to be programed with Al's personality and memories. As Al grapples with this new world and his new identity, numerous questions arise about his life that go beyond his mysterious resurrection. He may be the world's closest copy of Alastair Sterling, but is he really Alastair Sterling? Can he and Brendan be to one another what they once were to one another? Why, if she has Al's memories and more, has Sulla determined that she is female? And what is Al's relationship to this world in which he is creator, created, and Rip Van Winkle all in a single package? Thankfully, Delliquanti seems less interested in answering these questions than in exploring the relationships between the characters. O Human Star may end up being a bit of a mystery, a bit of a romantic love story, and a bit of a familial love story, but it is ultimately a story about people figure out who they are and what they love in a future where the options are wide open.